Size is fine on my end, I'm on a desktop PC with a widescreen monitor (1440x900), what res are you at, Solarius? Exactly the same. And to see it all, I have to make the font reeeeally smaaaaaall. EDIT: Sorry about mentioning this. But I've been approached by users who complained about too big pics. Completely forget about it. Thanks, taking. 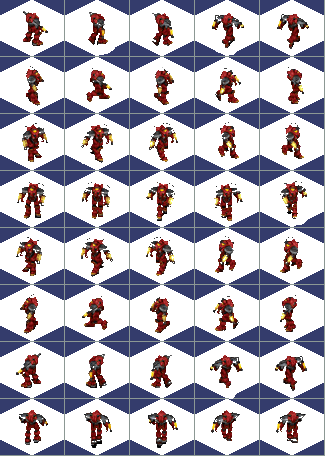 The classic X-Com skull, converted from explosion effect to hit animation! Here's the Triscene in UFO palette - inventory picture and Ufopaedia picture. I might as well ask here: I'm looking for some robot sprites that I saw in a lesser known mod somewhere that I can't find right now. Anyone knows of any sprites depicting robots/cyborgs/etc.? Robin has a few units in From the Apocalypse, but these are more drones than humanoid robots. On the mod portal there is a user named Miguel who made some robotey things: here, here and here. Also some HWP-like vehicles. Jackstraw2323 and his War of Shadows mod has the Jaeger robots and possibly something else, too. If you're interested, you'll find the resources in FactionsPack/Cyberweb. Fallout units also look reasonably rippable. But if you ever find it, please share it. I really like them. Could you please post the files? +Update: reattached zip file with small handob fixes. Good idea and picture. I `ve made some stuff for Diving Drill.